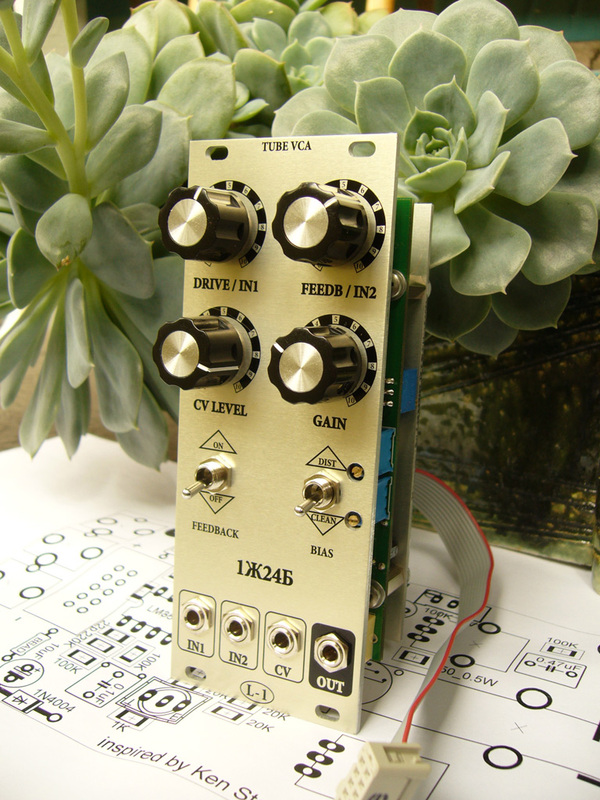 TUBE VCA / DISTORTION / WAVESHAPER / TIMBRAL GATE / etc. I considered the mods described at e-m forum, Thanks to PrimateSynthesis for that great work http://electro-music.com/forum/topic-26469.html . 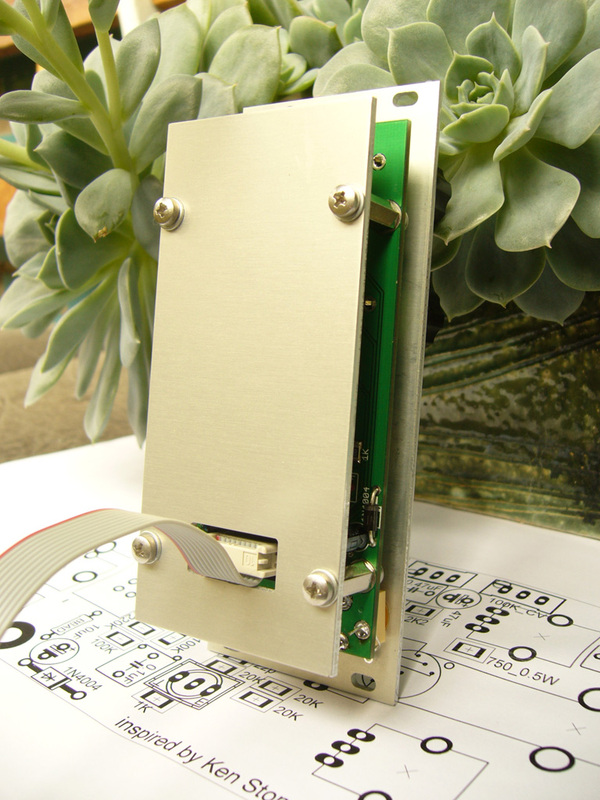 The project will be available as PCB + panels + tube set in October. Boards will be 2mm black/gold of course. I've bought 100 1Ж24Б 'new old stock' tubes from an old man from Murmansk. So tubes quantity is limited. Some tubes have 'tested for military use' stamp and they will go to first buyers. 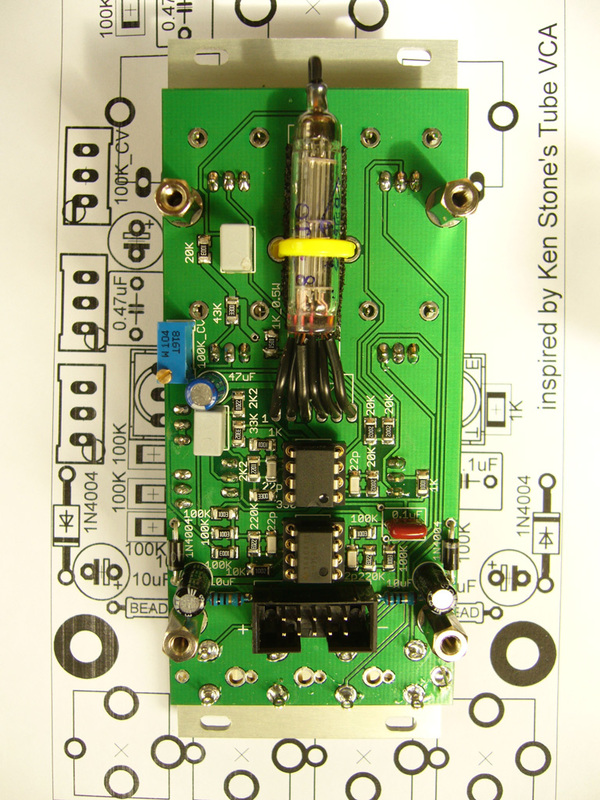 Here are photos, schematic and PCB. The prototype works & sounds perfect. The device has feedback loop which is normaled to IN2 jack, so IN2 pot controls feedback amount when nothing feed into IN2 jack and feedback switch is on. When jack feed into IN2, IN2/FEEDB pot controls IN2 level. Distortion/clean switch controls two modes with more or less distortion which amount can be trimmed with trimpots through holes at panel. Drive/IN1 pot controls IN1 level. GAIN pot controls gain offset. CV pot controls gain CV level. Great looking build! As it happens I have a tube VCA on my breadboard at the moment, but I'm using 2 x Sylvania 5840. This is the tube you're using? I've placed on a panel 1Ж24Б. Great soviet mini-tube. 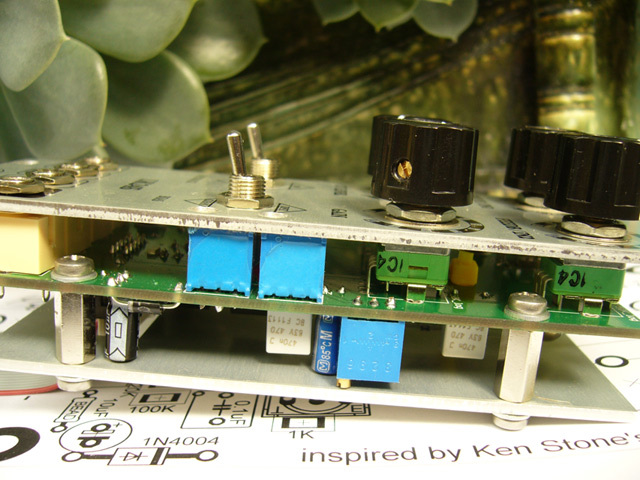 Will the kit be surface mount stuff? Or thru hole? I will offer SMD air soldering service - 10$ per board, it's for parts and my work. 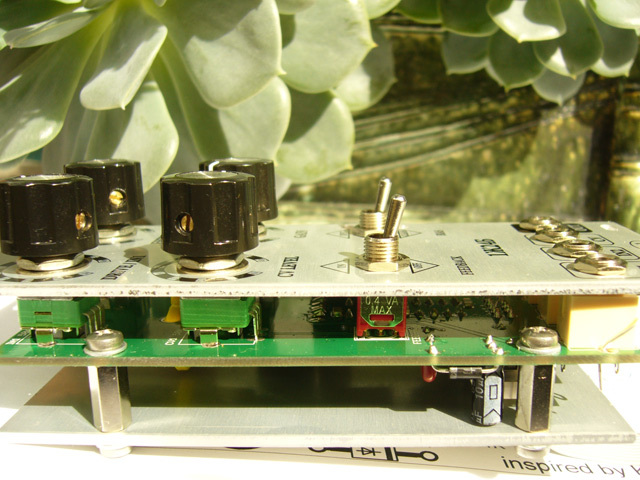 The device can work from 15V with minor changes. Oh... Wow! That does look very nice! Super cool, When it is ready do we buy from web site or like a group buy kind of situation? I will inform. Buy from site. Any pre-pay. Any news about the vactrol filter? Boards are on order. They have delivery time 25-30 days. So I think second half of September I will get them. I'd like one of these. I really like that you're putting back panels on your designs. 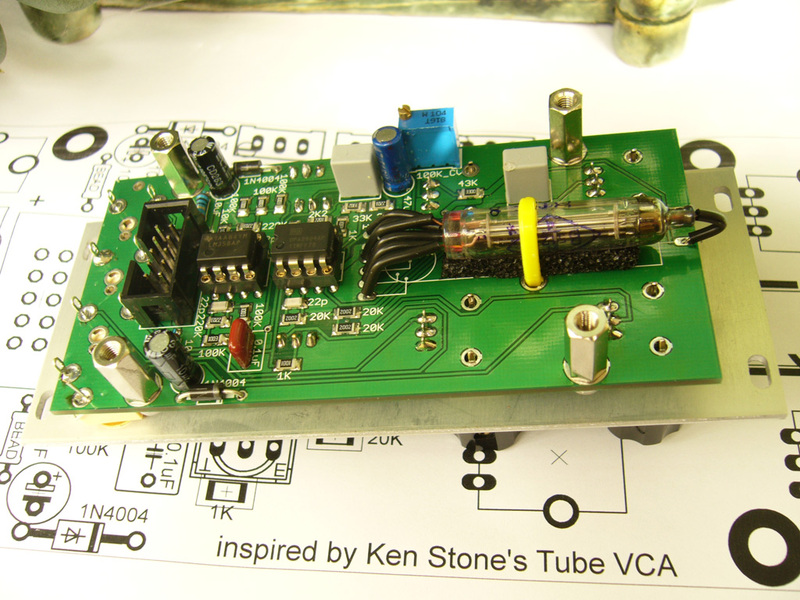 Sorry for the stupid question, but what is the advantage/disadvantage to the tube VCA vs one that is all solid state? Thanks L-1, and thank you Ken! A tube gives very nice sound coloring and overdrive / distortion. Will record samples soon. Is the tube hardwired here? Yes, but I made pads suitable for MTA-100 headers, so it can be made removable. wow L-1 you are trying to take all my money! looks like the 1J24B tubes are pretty widely available? I would assume no one is making them new manufacture though? what's the current draw? looks like 12hp? nice project , might be up for one ! !